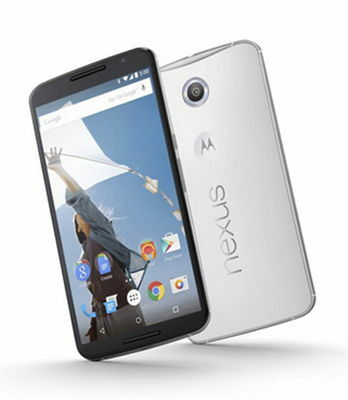 Available in midnight blue and cloud white, the Nexus 6 measures 6.27 x 3.27 x 0.40. The handset has a 5.9 inch display with a sharp resolution of 1440 x 2560 giving a pixel density of 493 ppi, perfect for playing games or watching movies. Protected with scratch resistant Corning Gorilla Glass 3, the display uses AMOLED technology which produces vibrant colours and uses less power when showing darker images as it turns off all black pixels completely. The Nexus 6 has a 13 megapixel camera with a dual LED ring flash for clear images in low light conditions and f/2.0 aperture. To the front is a 2 megapixel camera together with front facing stereo speakers above and below the screen which makes the device ideal for sharing videos or watching YouTube without the need for headphones. The Nexus 6, which is capable of shooting 4K video, features optical image stabilisation, Face detection, Geo tagging, HDR and Panorama.